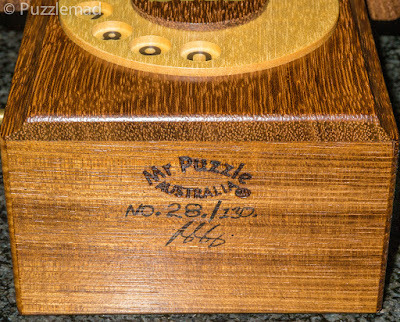 Puzzlemad New Additions: Limited edition madness! I'm old enough to remember phones with dials! Limited Edition set of 130 puzzles released Friday 24th June 2016. Unlike Katie Koala or the Opening Bat these tools are much more difficult to recognise and you'll notice at the end of solving you won't have anywhere near the same number of small pieces. The smallest piece that is removed from this puzzle is about the size of a micro sim card. Certainly there's no shortage of magnets, springs and other small moving parts inside the puzzle, its just that they are not removable. Brian designed most of the puzzle during Easter 2014 and has been developing and building the puzzle ever since. It's his first major project since Katie Koala was completed in 2013. He has no plans for another for the remainder of this year or until at least the end of 2017. Brian wants to especially thank Junichi for getting the concept and design out of Brian’s head and into CAD. Juno really helped make this puzzle a reality; he's a great sounding board and a great help to Brian with woodworking and assembly of the puzzle. It's fair to say the puzzle has consumed them both for most of the past year. A bonus puzzle. Unintentionally we incorporated an optical illusion. Can you find it? 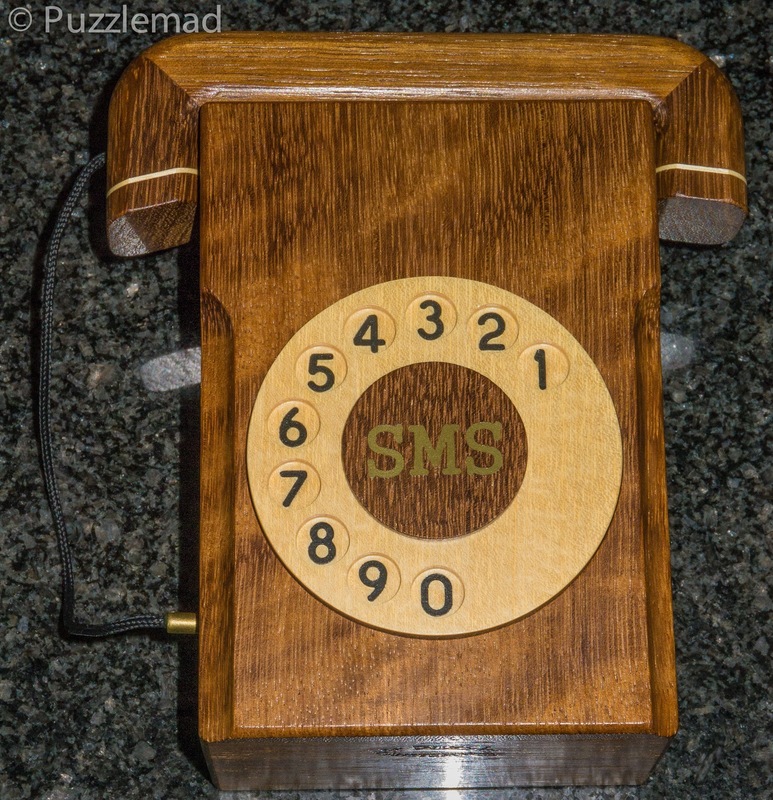 This telephone comes with a lifetime membership to Mr Puzzle's wooden telephone network with unlimited disassembly and re-assemblies of this puzzle per month. Woods: The SMS Box is made from Queensland Blackbean. The dial is made from Queensland Silver Ash. Size: The box is 150mm x 105mm x 68mm plus the handset on top. The puzzles are individually numbered in the set (example No.1/130) and signed and come with a certificate. This year's LE puzzle is much less limited than before as Brian is producing 130 of them - I managed to obtain my usual number 28. I suspect they will not disappear off the shelves too quickly because this one has a fairly hefty price tag due to the sheer enormous amount of work that has gone into producing them. The asking price for those outside Oz is $1100 AUD and very luckily for me I made my purchase before the Brexit decision by our crazy nation caused the £ to fall to a 30 year all time low! 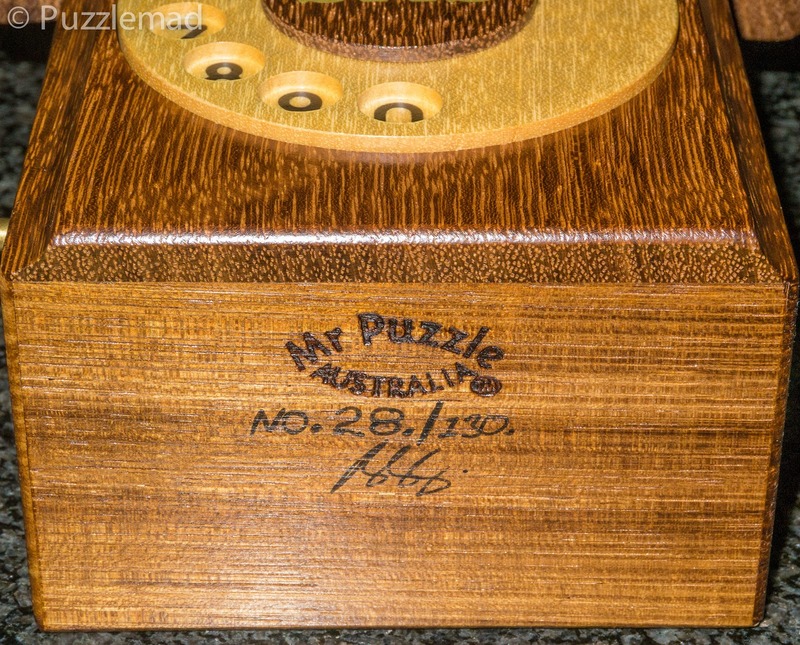 Many of us received this puzzle and as far as I know only one person has announced that he has solved it. There are an awful lot of us who have owned it for up to 2 weeks and gotten absolutely nowhere! I haven't even mastered the first step yet!!!! Aaargh! I suspect this will be in my top ten puzzles of the year - but I am not sure which year it will be! It may end up like Katie Koala and be acquired in one year but not solved until the following year!